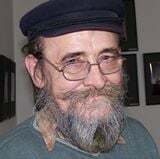 Madigan Thomas was born c. 1932 on Violet Valley Station just south of Warmun. As a child, she assisted the women with yard and domestic duties around the station, and learnt from her elders the very depths of her culture which remained with her for the rest of her life. On moving to reside on Mabel Downs Station after Violet Valley became an outstation (her son Bruce has now converted Violet Valley (Baulah-Wah) back to a working cattle station), she assisted her stockman husband Sandy (who passed away in late 2009). Madigan rode with the men, mustered the cattle and undoubtedly kept up with the best. She educated her children whilst living in Wyndham and gave them the benefit of higher education – demonstrating how astute this lady is – she knew the importance of this and her children have succeeded, with Ethel becoming a teacher and later C.E.O. 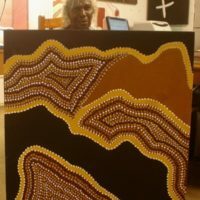 of Warmun Community, her son was the former Chairperson of Warmun Community, her eldest daughter, Shirley Purdie, a famous artist in her mother’s footsteps, and in turn Madigan’s grandchildren are succeeding in their chosen professions. Madigan and Sandy’s community was Violet Valley, her home country – and, whilst living at Warmun Community with Shirley, spent as much time as possible at Violet Valley. When Madigan painted her home country, the works were invariably softer than her often strong style, and one can only assume that here is where she relaxed. She was a strong woman who spoke her mind freely and directly and believed in her Traditional woman’s law, particularly in relation to young girls. Madigan demanded respect and it was given freely to this wonderful lady. The 1970’s saw the establishment of the women’s painting movement championed by Queenie McKenzie and Madigan Thomas. These two women are mentioned very often in the same context as Rover Thomas and Jack Britten. Madigan’s style was wide and varied – from delicately dotted landscapes to vivid black lines of the open cut diamond mine on the Women’s Sacred Site, to extremely clever sketch paintings of animals – like Jack Britten and all great artists, Madigan can sketch Kartiya (whiteman) style. 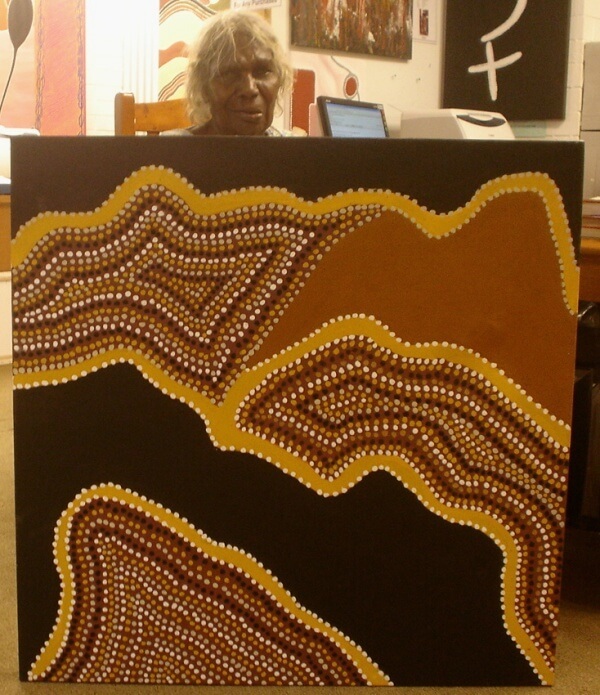 It has been written that Madigan’s style of painting was characterised by various pathways and dreaming tracks that meander through the painting. To view the paintings aesthetically they are flowing, sometimes simplistic and sometimes detailed; however, they invariably portray or show the whole story. 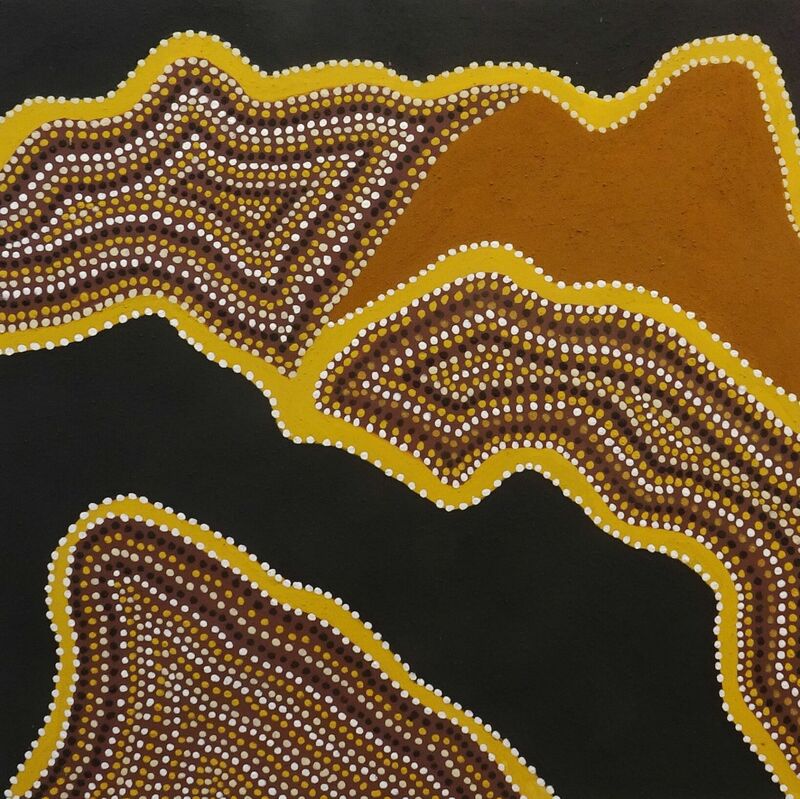 Madigan participated in many exhibitions and was a finalist in the 1994 National Aboriginal Art Award, her paintings are much sought after and she was never seen to produce anything other than a really excellent piece of art. Madigan is considered by many experts as one of the most important contemporary painters of our time. Madigan was the epitome of a strong Kitja Law woman. 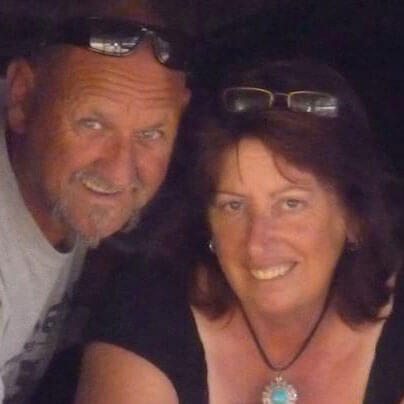 She passed away in August 2011 and was laid to rest next to her husband Sandy on her beloved community of Violet Valley. 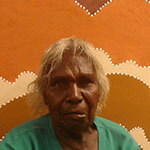 – Finalist Eleventh National Aboriginal Art Award Exhibition, Museum and Art Gallery of the Northern Territory, Darwin. – Paintings by Warmun Women, Kingston, A.C.T. – Prestigious Private and Corporate Collections within Australia and world-wide. This country is around Nine Mile, Norton Bore. It’s the place where we can find the biggest lot of Sugarbag (wild honey). Our people have always gone there to get that Sugarbag. One day, my daughter Shirley took me there – and we were getting that honey, and Shirley looked under a big tree which had been pushed over with the wind. Well, the biggest mob of sugarbag we have ever seen was there. We were filling up everything we had to take that sugarbag back with us. No grass growing there ever, and salty in the wet. It’s the salt that stops the grass growing. No good for feed for cattle. Not much good for anything really. Sometimes we find Binkirrbal (bush turkey) around there, and sometimes kangaroo. Mostly find them up top. (When Madigan says “not good for anything really” she is referring to the fact that the land in the East Kimberley was originally under sea water. The salt level is very high. The Sugarbag Country in the region consists of salt pans and the country is not able to sustain pasture).